One of Melbourne's best kept secrets for breakfast. I came here for breakfast with a couple of friends for a Saturday morning brunch about a month ago. 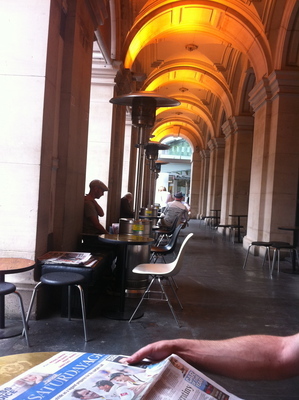 The Federal Coffee Palace is tucked away in the GPO along Elizabeth Street on the cusp of Bourke Street Mall. For the life of me I cannot remember what was spent on breakfast on this occasion, yet the experience was laid back, peaceful and cozy. Perch yourself outside and you will feel like you're eating out with royalty. The staff are super efficient, and yes they're full of energy and life. 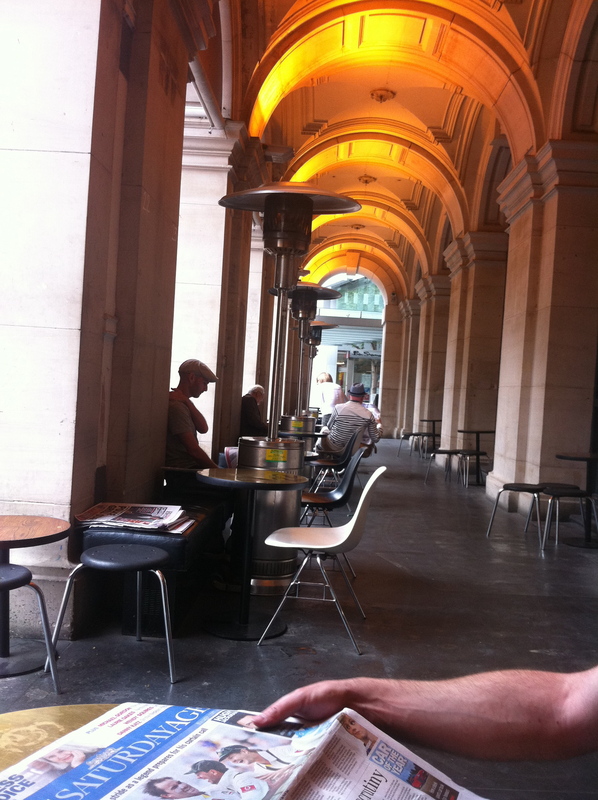 Come here with a newspaper in tow, or catch up on e-mails on your iPhone, iPad or similar device. The latte set the scene for a lovely breakfast. The only qualm would have to be the small table space once the breakfast arrives. If you're trying to juggle reading The Age with it all, then good luck. Back to the latte. 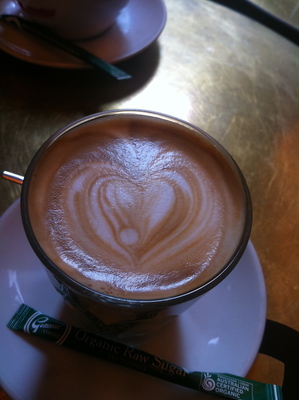 The latte art was divine, with a love heart. My friend's mocha was also divinely artistic. 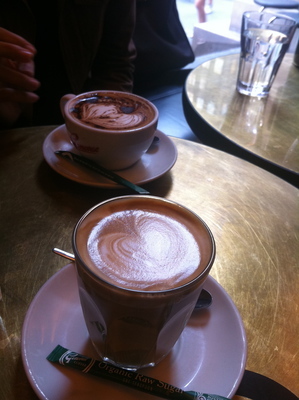 As many Melburnians would agree, there is more to a latte than just the love of art. There was no need to constantly gain the sugar rush as the latte turned out to be well roasted with the right amount of milk. A good quality coffee bean was used and naturally, being a coffee palace, the beans would have to have come from the arabica family. Just right, and just perfect. 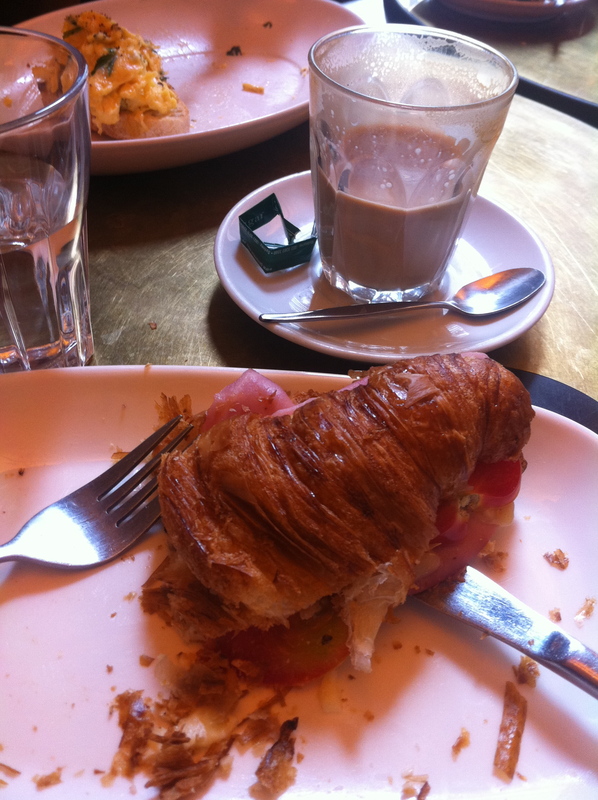 The temperature, the crema and the taste, all of it. The ham and cheese toasted croissant just hit the spot. If you're hungry yet not on the verge of starving, then this heated delight will be your Saturday morning European treasure. Just ensure that you also have a jug of water in tow. 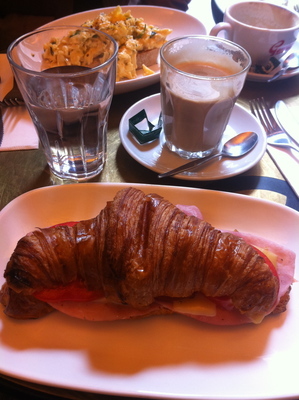 This is incredibly rich, and despite being toasted (albeit crunchy), the croissant was utterly moist with fresh ham and cheese slices. Heavenly. 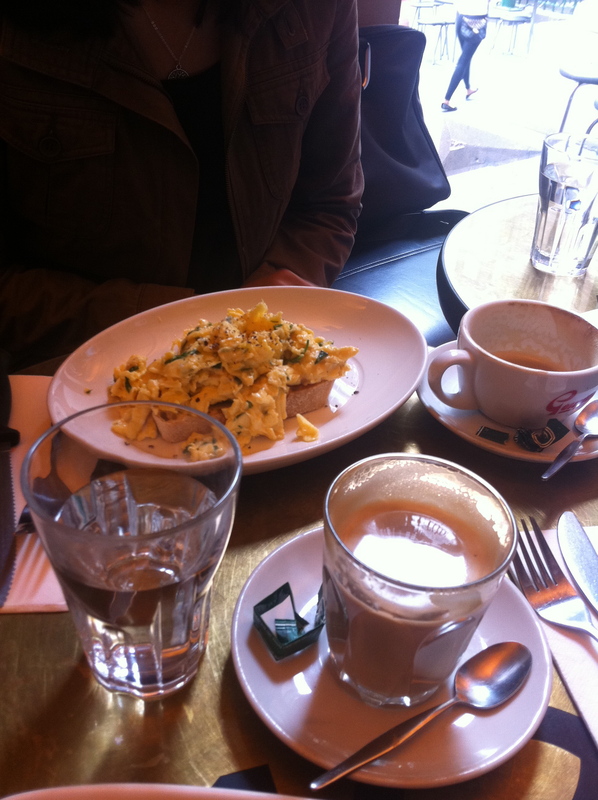 My friends' scrambled eggs with herbs was rather filling, and again a deliciously presented dish. All in all I am glad they recommended this place. It is funny how you used to live in a city for a period of time, and you then return to that city as a visitor to discover places you have never seen before. Definitely a palace of foodie and coffee delights to bookmark and return to again. Bon appetit to a Saturday morning brunch in the city.